My family loves “bowls.” We eat some variation of bowls every week, and this is one of our favorites. Meal prep tip: this dish requires some veggie prep, which can be done ahead of time — ideally on the weekend when you have more time. I like to prep the veggies on the weekend, and then store them in airtight containers in the refrigerator until I’m ready to make the bowls. You could also make the sauce on the weekend. That way, the meal can be made in about half an hour on busy weeknights. Here’s another meal prep tip: make a double batch of quinoa on the weekend. That way, you can use half of it for these Buddha Bowls, and you can use the rest to make sweet Overnight Quinoa Cups or savory Quinoa Black Bean Salad with Jalapeño Vinaigrette. 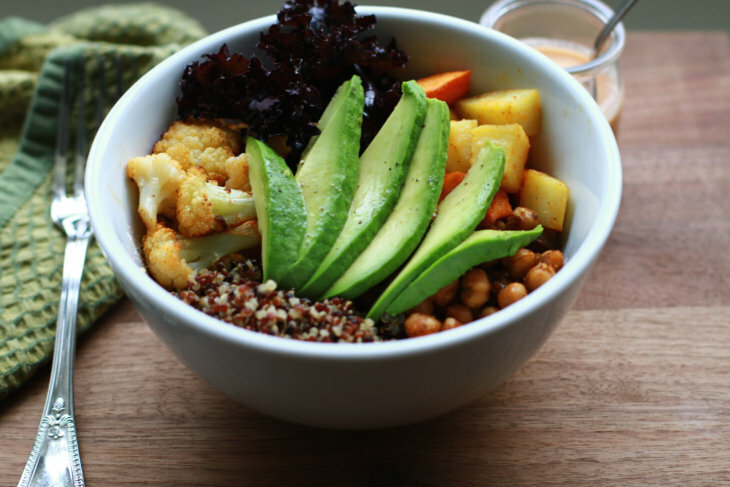 The term Buddha Bowl typically refers to a vegetarian dish that includes grains, steamed or roasted vegetables, and some beans. This recipe features two of my go-to roasted vegetables: sweet potatoes and cauliflower. 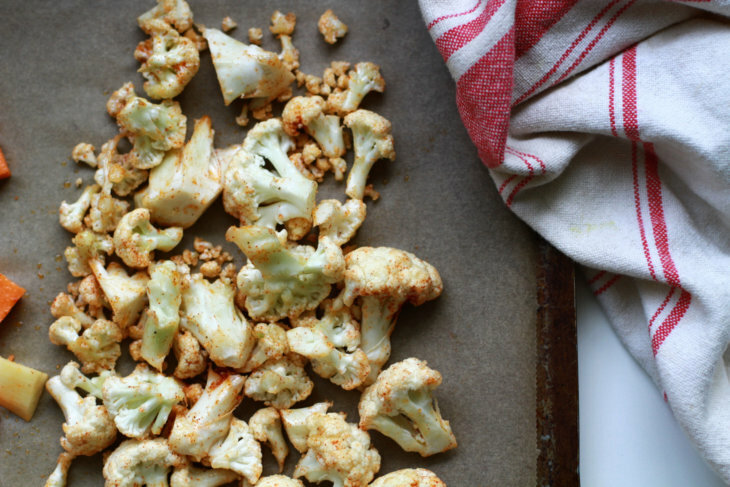 Love that roasted cauliflower — tastes like french fries! We also throw in some roasted onion and red bell pepper for additional flavor and nutrients. Quinoa is the base here, although you could certainly substitute with rice. I like quinoa because it can be a little easier to digest, and it also contains some protein. You’ll also get some protein from the chickpeas, which are sautéed in a pan with some onion and spices. The true star of the show here — in my opinion — is the dairy free Spicy Buffalo Sauce. 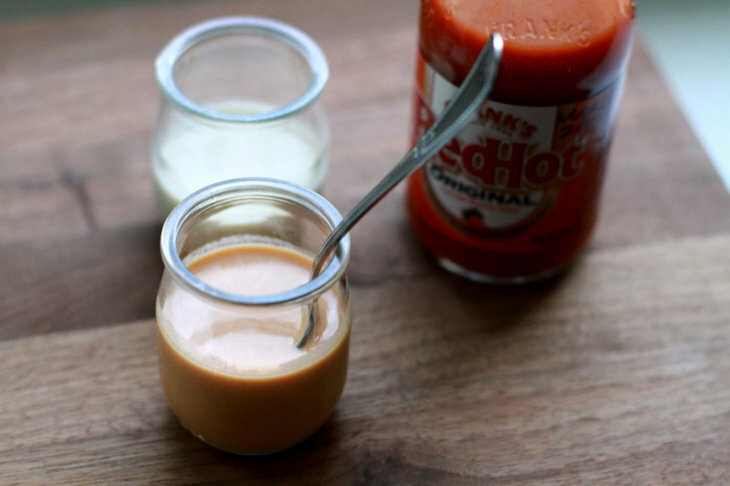 All you need to do is make a classic tahini sauce of tahini, water, and lemon juice, and then add Frank’s Red Hot Sauce. Feel free to add more hot sauce to preference. I like things spicy, so I go with a 50/50 mix of tahini sauce and Frank’s. This recipe was inspired by Minimalist Baker and Pillar Life. Prepare the quinoa: heat a saucepan over medium-high heat. Once hot, add rinsed quinoa and lightly sauté for 2-3 minutes. This will help the quinoa develop a nutty flavor. Add the water. Bring to a low boil over medium-high heat. Then reduce heat to a simmer and cover. Cook for about 20 minutes or until liquid is absorbed and quinoa is light and fluffy. Remove the lid and fluff quinoa with a fork. Remove from heat and set aside. While the quinoa is cooking, prep the vegetables. Rinse the kale, and strip the leaves off the stem (discard or compost the woody stem). Tear the kale leaves into bite-size pieces, or give a rough chop with the knife. Peel, seed, and chop the red pepper. Peel the onion and slice in half — chop one half (for sautéing), and slice the other half into wedges (for roasting). Remove the core and leaves from cauliflower. Cut in half, and separate the cauliflower into florets. 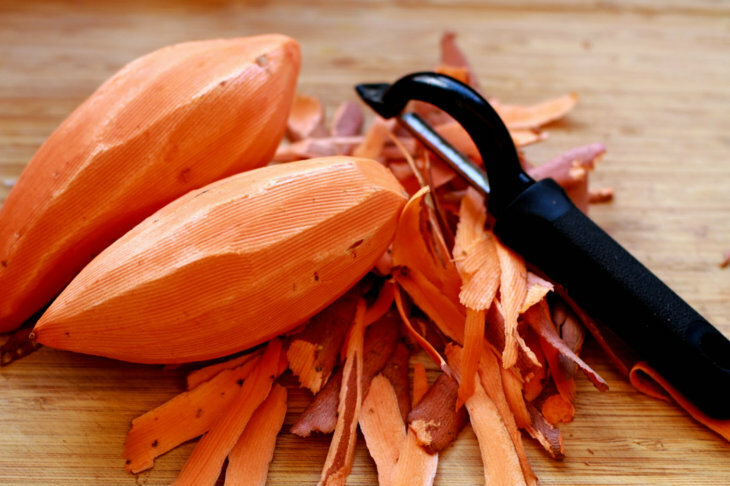 Add the sweet potatoes into a mixing bowl. Drizzle with avocado oil, then season with salt and pepper. If desired, flavor with a shake of granulated garlic and some smoked paprika. Place vegetables in a single layer onto a baking sheet lined with parchment paper. Repeat this step with the cauliflower and red bell pepper, prepping one vegetable at a time. Add the vegetables onto the baking sheet alongside the sweet potatoes, creating sections for each vegetable. When it comes to the onions and kale, set these aside after prepping. They roast more quickly, so we'll add those to the oven once the sweet potatoes and cauliflower have been roasting for awhile. Roast the sweet potatoes and cauliflower for about 20 minutes, flipping the vegetables at the 10 minute mark. After 20 minutes, add the onion and kale. Continue to roast all of the vegetables for another 10 minutes. The vegetables are ready when you the cauliflower has turned golden brown and is crisp around the edges, and the sweet potatoes are easily pierced with a fork. While the vegetables are roasting, take a couple minutes to prepare the tahini sauce. Add the tahini, lemon juice, and 1/2 teaspoon granulated garlic to a small bowl. Slowly whisk in the hot water, and continue whisking until a sauce is formed. Add more hot water to reach desired consistency. Then, add Frank's Red Hot sauce, adding more to taste. Set aside. Now, let's prepare the chickpeas. Add the dried spices together in a small bowl: granulated garlic, smoked paprika, cumin, chili powder, and oregano (or Italian seasoning). Add a drizzle of avocado oil to a non-stick pan over medium heat. Add the chopped onion and sauté for a few minutes, until the onion is soft and translucent. Add the spices, and stir for a minute until the onions are coated with the spices. Add the beans and reduce heat to medium, stirring frequently for about 5 minutes. You don't need to cook these any longer — we're just warming up the beans and letting the flavors from the spices meld a bit. Once the vegetables are ready, you can make your Buddha Bowl. To assemble: place a mound of cooked quinoa in the center of the bowl. Place the roasted veggies, in sections, around the quinoa. Top with sliced avocado and drizzle with Spicy Buffalo Sauce. Serve extra sauce on the side. Hope you love these Buddha Bowls as much as we do! 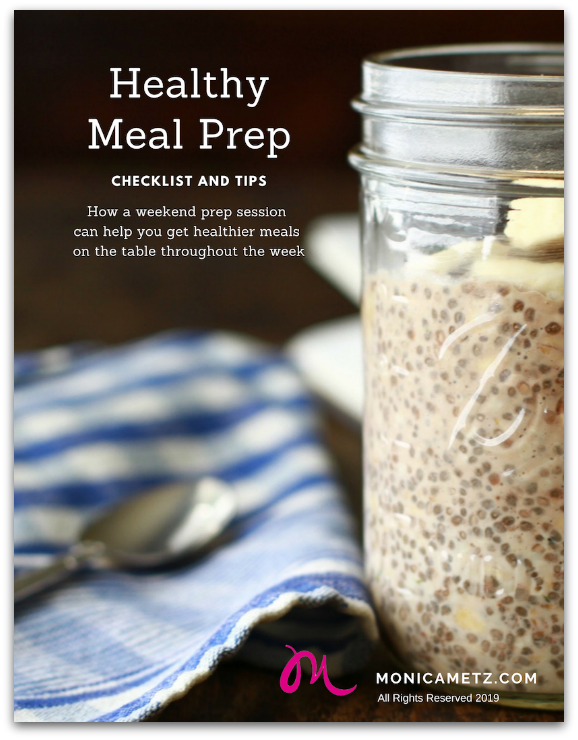 Need some extra help with healthy meal planning?